The Smith Cloud, a gigantic streamer of hydrogen gas, is on a collision course with the Milky Way Galaxy., hurtling toward its doom at more than 540,000 miles per hour. But that means the impact will happen in approximately 30 million years. Yet when it does, it will set off a spectacular burst of star formation. All is not lost, though. It would first have to navigate through the halo of hot ionized gas surrounding the Milky Way, and to do that it has a secret weapon: A magnetic field deep in the cloud's interior which may protect it during its meteoric plunge into the disk. "The million-degree upper atmosphere of the Galaxy ought to destroy these hydrogen clouds before they ever reach the disk, where most stars are formed," said Alex Hill, an astronomer at Australia's Commonwealth Scientific and Industrial Research Organization (CSIRO) and lead author the paper in the Astrophysical Journal. "New observations reveal one of these clouds in the process of being shredded, but a protective magnetic field shields the cloud and may help it survive its plunge." Many hundreds of high velocity clouds (HVCs) zip around our Galaxy, but their obits seldom correspond to the rotation of the Milky Way. 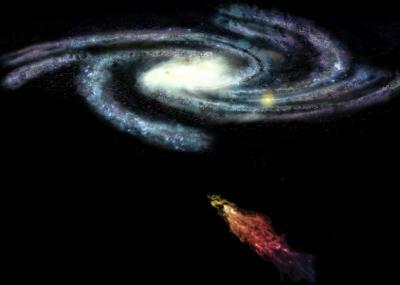 This leads astronomers to believe that HVCs are the left-over building blocks of galaxy formation or the splattered remains of a close galactic encounter billions of years ago. Though massive, the gas that makes up HVCs is very tenuous, and computer simulations predict that they lack the necessary heft to survive plunging through the halo and into the disk of the Milky Way. "We have long had trouble understanding how HVCs reach the Galactic disk," said Hill. "There's good reason to believe that magnetic fields can prevent their 'burning up' in the halo like a meteorite burning up in Earth's atmosphere." Despite being the best evidence yet for a magnetic field inside an HVC, the origin of the Smith Cloud's field remains a mystery. "The field we observe now is too large to have existed in its current state when the cloud was formed," said Hill. "The field was probably magnified by the cloud's motion through the halo." Earlier research indicates the Smith Cloud has already survived punching through the disk of our Galaxy once and -- at about 8,000 light-years from the disk -- is just beginning its re-entry now. "The Smith Cloud is unique among high-velocity clouds because it is so clearly interacting with and merging with the Milky Way," said Felix J. Lockman, an astronomer at the National Radio Astronomy Observatory (NRAO) in Green Bank, W.Va. "Its comet-like appearance indicates it's already feeling the Milky Way's influence." Since the Smith Cloud appears to be devoid of stars, the only way to observe it is with exquisitely sensitive radio telescopes, like the GBT, which can detect the faint emission of neutral hydrogen. If it were visible with the naked eye, the Smith Cloud would cover almost as much sky as the constellation Orion. When the Smith Cloud eventually merges with the Milky Way, it could produce a bright ring of stars similar to the one relatively close to our Sun known as Gould's Belt. "Our Galaxy is in an incredibly dynamic environment," concludes Hill, "and how it interacts with that environment determines whether stars like the Sun will continue to form."